We're rapidly closing in on the finale of the fun series started by fellow Anzac book blogger Kerrie at Mysteries in Paradise, where each week bloggers from around the world write about a notable crime fiction novel or author (first name or surname) starting with a particular letter of the alphabet. This week is the penultimate entry, being the turn of the letter "Y". I have decided to take a short look at a 'rising star' author I haven't read yet, but has been on my 'to read' list for a few months, and whose second novel (MY SOUL TO TAKE) is sitting right in front of me now, near the top of my TBR pile: Icelandic writer Yrsa Sigurðardóttir. Yrsa Sigurðardóttir was born in the Icelandic capital of Reykjavík on August 24th, 1963. She enjoyed reading as a child, and has said in interviews that she grew up particularly loving "the Finnish Moomin troll books by Tove Jansson. They tell the adventures of a family of white hippopotamus-looking trolls or elves that were in hindsight pretty depressed and strange for characters from a children's book series." Note: According to Wikipedia, some Icelandic last names, such as Sigurðardóttir, are patronymic or matronymic, rather than surnames, so Yrsa Sigurðardóttir should properly be referred to by the given name Yrsa (so that's what I'll do here). In an interview with Sarah Walters (see link below), Yrsa said she started reading Agatha Christie at the age of about 12 or 13, and has loved crime fiction ever since. Yrsa is an engineer by trade; she graduated from high school in 1983, then finished a BSC in Civil Engineering from the University of Iceland in 1988. She also earned an MSc in Civil Engineering from Concordia University in Montreal, Canada, in 1997. Yrsa still works as a civil engineer, as well as being a writer. According to the HarperCollins website, she is currently one of the directors of Verkís, one of Iceland's largest engineering firms, and lives with her family in Reykjavík. She has two children, and one grandchild (a recent addition). She started writing children's stories in the 1990s, with her first published book for children, Þar lágu Danir í því, being released in 1998. Her children's books have won the Icelandic Children's Book Prize (for BIObörn (BIO Children) in 2003), and the IBBY Iceland Award (for við viljum jólin í júli (We Want Christmas in July) in 2000). 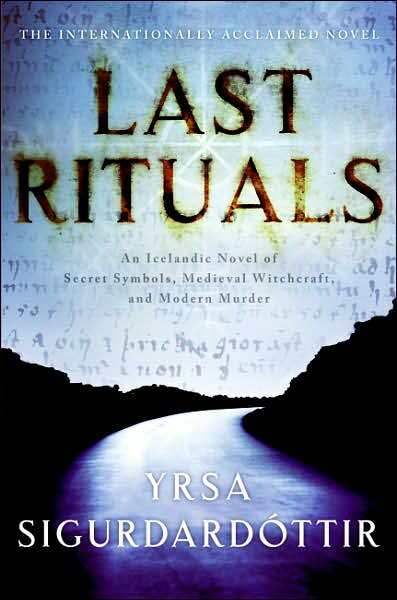 Yrsa turned her hand to adult crime fiction in the mid 2000s, and her crime story Þriðja táknið (LAST RITUALS) was published by Veröld publishing house in 2005. It was translated into English in 2007/2008, making Yrsa only the second Icelandic mystery writer to be translated into English (after the acclaimed Arnaldur Indridason), and in in fact the debut crime novel ended up being published in 30 countries. The blurb for LAST RITUALS states: "At a university in Reykjavík, the body of a young German student is discovered, his eyes cut out and strange symbols carved into his chest. Police waste no time in making an arrest, but the victim's family isn't convinced that the right man is in custody. They ask Thóra Gudmundsdóttir, an attorney and single mother of two, to investigate. It isn't long before Thóra and her associate, Matthew Reich, uncover the deceased student's obsession with Iceland's grisly history of torture, execution, and witch hunts. But there are very contemporary horrors hidden in the long, cold shadow of dark traditions. And for two suddenly endangered investigators, nothing is quite what it seems . . . and no one can be trusted." From interviews, reviews, and comments about Yrsa's writing that I've read, it seems that she balances some dark or creepy elements in her storytelling with some brightness and light in terms of humour and the family life of her main character. I would imagine this might trace back to her beginnings as a children's author, and also her love of the 'troll' books as a youngster; mixing dark and strange with light and comic or fun. Yrsa brought Thóra Gudmundsdóttir back the following year in Sér grefur gröf, which was published in English as MY SOUL TO TAKE in 2009. This is the book that is beckoning me from my bookshelf. 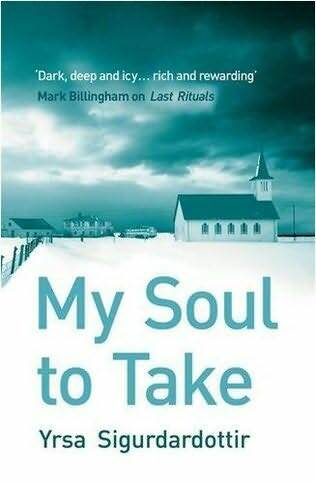 The blurb for MY SOUL TO TAKE says, "When the body of a young woman—badly beaten and with pins inserted into her feet—is found at a New Age health resort in a renovated farmhouse, lawyer and single mother of two Thóra Gudmundsdóttir is called upon to represent the chief suspect, the resort's owner. But upon her arrival she encounters more than a fresh corpse—local legend has it that the resort, located in the mystical region of Snæfellsnes on Iceland's west coast, is haunted. At first Thóra dismisses the claims as nothing more than myth and superstition, but even she can't explain the bizarre occurrences she witnesses in her search for answers. As Thóra digs deeper into the farm's past, she discovers long-buried information on the property's disturbing history, and her once-solid view of reality begins to waver. Are the hauntings real, or just a case of folklore gone wild? And, more important, does the farm's eerie past have something to do with the murder? When another body is discovered—looking very much like the first—Thóra is forced to put aside her doubts and confront the horrors of the present before a twisted killer strikes again." Murder is Everywhere - Yrsa is one of six crime writers from "different corners of the world" who reguarly post on this fascinating blog - the others include Leighton Gage from Brazil, Cara Black from France, and Michael Stanley from South Africa. Yrsa posts on most Wednesdays. Scene of the Crime - a good, very recent, interview with Yrsa by acclaimed crime writer and blogger J. Sydney Jones (the author of a series of mysteries set in historic Vienna). Yorkshire Post podcast - a fascinating 30mins plus audio interview with Yrsa, by Sarah Walters, from last year's Harrogate Festival. YouTube - Yrsa takes viewers on a very interesting tour of her home country of Iceland and the setting of her popular crime novels. Yrsa also provides some fascinating comment about her own crime writing, and her work as an engineer, in this 6 1/2 minute video. So, have you read Yrsa Sigurðardóttir? If so, what do you think of her writing? If not, do her books appeal? Does Icelandic-set crime intrigue you? Thoughts and comments welcome. 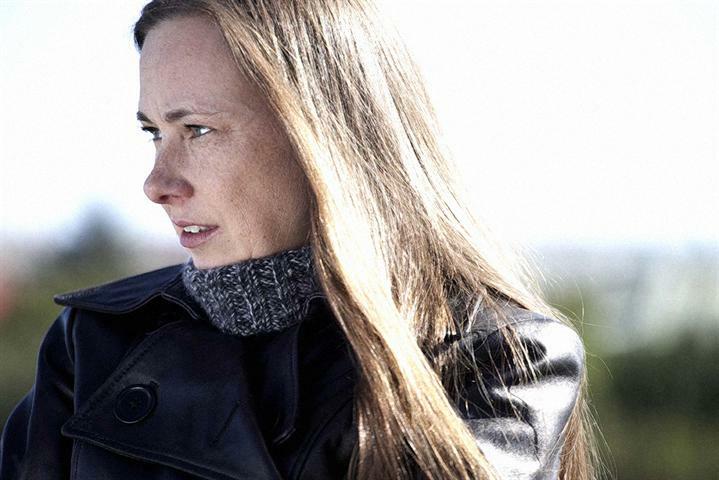 Craig - Thanks for this profile of Yrsa Sigurðardóttir. This is an author I haven't tried yet, either, but after your profile, and some of the reviews that I've read of her work, I'm certainly intrigued. I think you made a fine choice : ). I have read LAST RITUALS and really enjoyed it (rated it a 4 out of 5). I was particularly taken with the humour of the book - something that I think is extremely difficult to pull off in a translation so kudos must also go to Bernard Scudder for his excellent translation. Thora carries on a very humorous internal monologue and her banter with Matthew Reich is also full of fun - so much so they could almost be Aussies :) The plot was a little weaker than the characterisations but still well worth reading and I am looking forward to the second book which hasn't yet made its way to my TBR but will very soon. I read Last Rituals several months ago and will recommend it for one of the f-t-f book groups I belong to. The mystery plot wasn't bad at all, and I found the witchcraft information and rituals interesting. I do agree with Bernadette, though, that characterization is her strong point in this work. I also agree that the translation is excellent and rarely did I get the feeling that this was a translation, something which, unfortunately, happens all too often in other works. I'm looking forward to the second book in the series. I wonder if Matthew Reich is coming back in the second book.